New Balance 680 v3 Reviewed - To Buy or Not in Apr 2019? Stability shoes are necessary for those who exhibit mild to moderate overpronation in their running style. Those who overpronate run the risk of knee pain and injury and a decreased ability to run to their maximum potential. Fortunately, many companies now make lines of stability shoes to counter this problem, including firm posts to reinforce the arch side of the midsole to correct overpronation (or at least counter its detrimental effects). For this, New Balance has put out a number of excellent stability shoes, and the 680 line is one of their best. The New Balance 680 v3 is the latest installment in their line of stability shoes, offering a flexible, softer, and overall more comfortable ride. The enhanced flexibility of the newly designed mesh upper is lighter and more adaptive than previous versions while still retaining its breathability. With this more flexible upper, runners will enjoy a better fit and more freeness while wearing the 680 v3. Add a reduction of stitching in the upper to lessen risk of irritation and this version is already a great improvement over previous editions. The increased flexibility found in the upper is also evident in the improved outsole of the 680 v3. New horizontal flex grooves in the forefoot and midfoot extend from the lateral to medial side, which provides a more relaxed ride without taking away from the stable arch support that makes this a stability shoe. 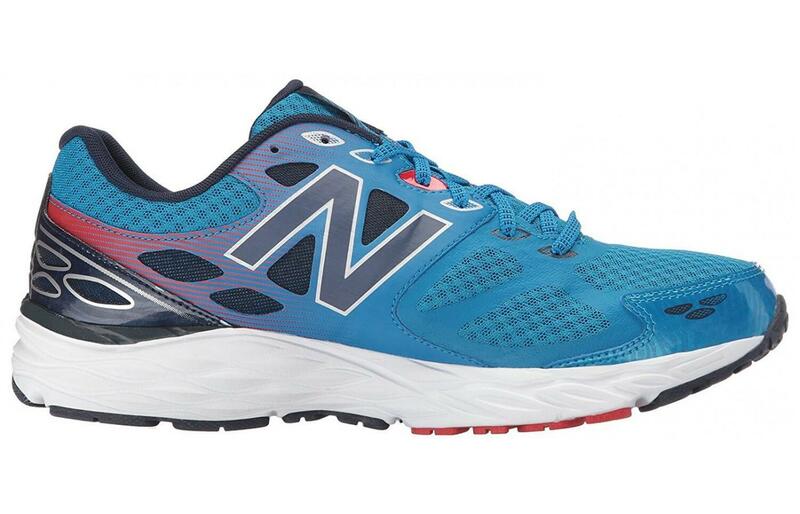 The New Balance 680 v3 also features improved traction on the outsole. By reconfiguring the diamond-shaped lugs and making them bigger, New Balance has improved the amount of leverage a runner can get on the pavement or even light trails. Designed with flexibility, comfort, and arch support in mind, the 680 v3 is a stability shoe that offers runners with overpronation a better class of daily trainer. Made from blown rubber, the outsole of the 680 v3 features enhanced traction thanks to larger diamond-shaped lugs with which this version has been outfitted, particularly in the midfoot where runners will notice the tenacity of these lugs when on a run. A decoupled heel has also been designed to facilitate softer landings, helping absorb the shock of each foot strike. Highly durable, the outsole of the 680 v3 was built to last and keep its grip far into its use as a daily trainer. Seeking to provide an extraordinarily comfortable ride, New Balance has an injection molded midsole for the 680 v3 that covers the entire length of the shoe from heel to forefoot, providing the runner with great cushioning and responsiveness. 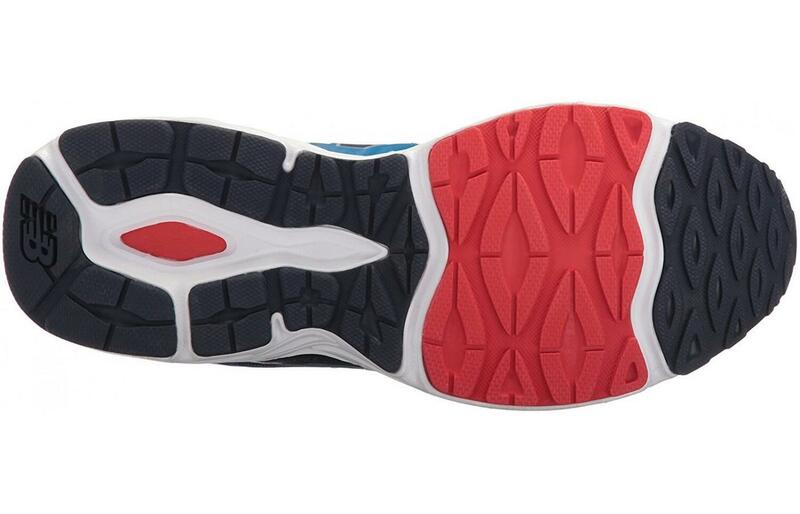 With ABZORB foam in the heel to add cushioning and absorb shock and a midsole insert at the arch to keep overpronation to a minimum, the midsole of the 680 v3 is constructed as a stability shoe that provides comfort with each step. The improved upper of the 680 v3 offers much more flexibility than previous editions. The breathable mesh covers the upper allows for breathability and a natural fit. Its stitched and welded overlays help in the trainer’s overall structural support while providing midfoot lockdown. Meanwhile, the entrance and interior of the 680 v3 is lined with soft fabric that provides an overall plush feel. Versatile with a removable insole, the runner can personalize the fit of the shoe, but even just wearing the trainer as it comes provides a great deal of comfort. The 680 v3’s plush cushioning and sturdy outsole come at a cost, and that’s in its overall weight. With the women’s edition coming in at 8.4 ounces/238 grams and the men’s weighing in at 10.5 ounces/298 grams, the 680 v3 is heavier than many lightweight trainers, but for a stability shoe with excellent cushioning, this is still a relatively average weight. The newly designed upper mesh of the 680 v3 is both lighter and more adaptive from its previous iterations while also retaining its excellent breathability. Although there are plastic overlays that may block some of the ventilation, these also offer great structural integrity to keep the foot firmly in place after lace-up. Overall, however, this is still a highly breathable trainer. Perhaps the best attribute of the 680 v3 is its comfort. From the fabric lining of the upper that keeps the foot secure and comfortable throughout the ride to its ABZORB foam in the heel to the injection molded midsole that offers a plush step-in comfort, the 680 v3 is an incredibly comfortable stability shoe that runners suffering from overpronation and neutral runners looking for a comfortable everyday trainer will appreciate. Eye-catching as always for a New Balance trainer, with the large signature N emblazoned on the side, the 680 v3 offers a vivacious splash of color that gives it a kinetic look. With wraparound overlays that provide structural integrity to the upper and a thick outsole that boasts of a tri-colored pattern, the 680 v3 is a riot of color at every turn. Even its shoelaces are equally colorful. Although it does come in more muted colors, New Balance seems to want runners to take notice of this trainer, with many options in bold pastels and multi-colored combinations outweighing more neutral options. For the runner that enjoys high-visibility trainers with fierce style, few come across as bold as the 680 v3. If one’s in the market for a trainer that will withstand many miles of pounding the asphalt on daily runs, the 680 v3 is a highly durable option. Its thick outsole covered in blown rubber and outfitted with large diamond-shaped lugs will withstand and retain its tenacity even after miles and miles have passed since first step-in, while the durable synthetic upper covered with a sturdy overlay will also keep its integrity even after becoming well-worn. At its price point, the 680 v3 is one of the more durable stability shoes on the market from a well-established brand. Although retaining a great amount of flexibility, the New Balance 680 v3’s upper is also well-protected by wraparound overlays that run from the side to the back of the heel and around, creating a protective rib cage that offers structural support and protection. Its thick outsole made of sturdy blown rubber also protects the foot from the many impact strikes that occur on a run, while the ABZORB foam cushioning in the heel further protects the foot from heel strike. With the rubber outsole extending to the toe box to protect the toes from impact, the 680 v3 is as protective of the runner’s foot as it is concerned with comfort. However, this is also a trainer specifically made with regular running surfaces (pavement, asphalt, track) in mind, and besides some light trail running is not meant to stand up to harsher elements. But for its intended purpose, the 680 v3 offers a great amount of protection. One particular compliment that’s been given to the 680 v3 is its responsiveness. 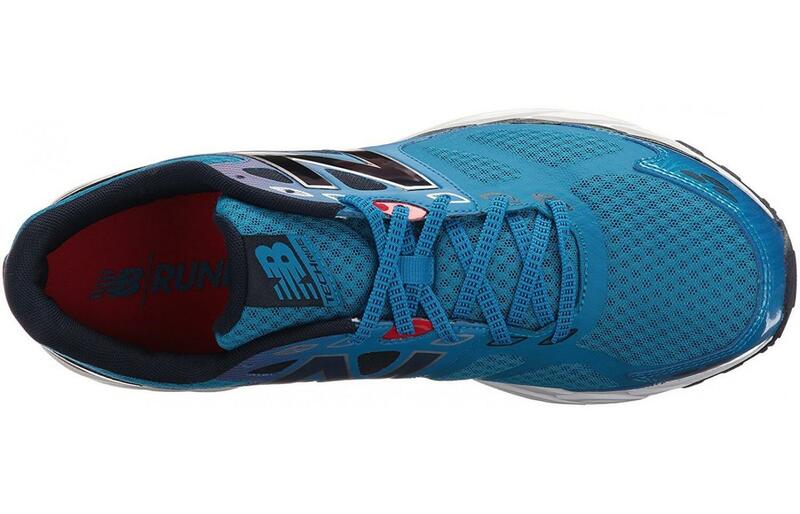 Despite offering plush cushioning for the runner, it’s also a highly responsive shoe. With its mesh upper with overlays that keep the foot firmly in place and offering the runner a great amount of seamless control over direction, thick lugs on the outsole that offer excellent traction and grip, flex grooves for greater surface control, and a soft but responsive injected molding midsole that provides a great amount of support for the runner, the 680 v3 proves that a plush feel doesn’t have to equal a loss in responsiveness. For runners that suffer from overpronation, the 680 v3 has support posts on the sides of the midfoot arch that alleviates and gives excellent control and support. Although neutral runners will appreciate the overall comfort of the 680 v3, those that need more arch support due to overpronation will find a plush trainer that delivers on support, as well. Made for the road and sidewalk runners, the outsole of the 680 v3 has tenacious diamond-shaped lugs that offer excellent grip and traction. This shoe can even handle some light trail running, but it’s optimized for traditional running surfaces of pavement and asphalt. While stability shoes come with a variety of options and are usually loaded with tech that drives the price up considerably, the New Balance 680 v3 has avoided the usual financial pitfalls of many other brands in its class. An exceedingly affordable trainer, particularly for a stability shoe, the 680 v3 has kept the price down while also delivering a high-performance, durable trainer that those suffering from overpronation will appreciate- and even those just looking for a comfortable everyday trainer can enjoy. With large diamond-shaped lugs that dominate the outsole, the New Balance 680 v3 features improved traction from previous versions, maximizing the amount of leverage a runner can yield while running on pavement or light trails. Although not as tenacious as some other running shoes, runners who are looking for a little more power traction-wise will find the 680 v3 performing above average for its price range. A key component in promoting the New Balance 680 v3 has been highlighting the improved flexibility of this version. Its upper mesh, while constrained somewhat by its overlays, is still highly flexible and aims to provide a superior fit for the wearer. Meanwhile, the horizontal flex grooves on the outsole placed at the forefoot and midfoot and extend from the lateral to medial side also allow for greater flexibility and surface control. Unlike many other lines on the market, the 680 v3 is specifically a stability shoe designed for runners who suffer from overpronation. With support posts at the arch of the foot where runners who overpronate need support the most, the 680 v3 seeks to provide a comfortable ride with improved stability. At 12mm, the drop of the 680 v3 is slightly higher than the average and accounts for the larger outsole that offers greater traction and leverage to the runner. Although this difference may seem somewhat noticeable for those more used to a minimalist trainer, this drop is also recommended for those who overpronate, which speaks to the 680 v3’s appropriateness as a serious stability shoe. 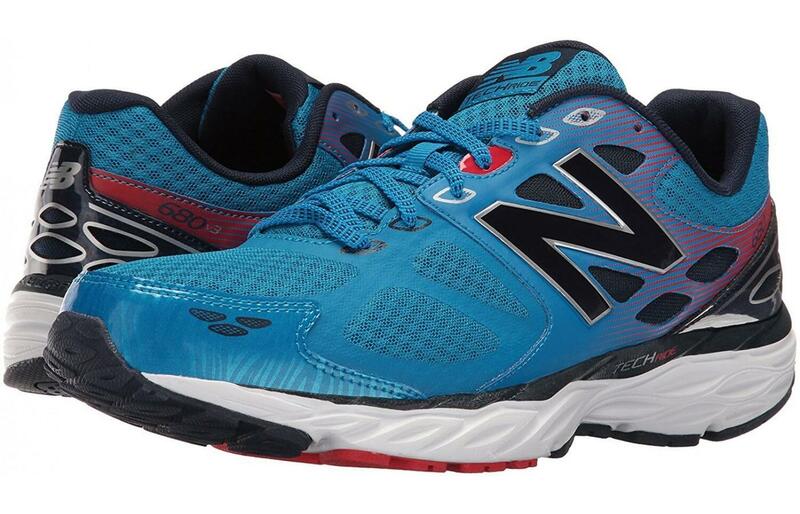 Stability shoes don’t have to be orthopedic monstrosities that sacrifice comfort or functionality just to adjust overpronation, and the New Balance 680 v3 is proof of that. Exceedingly comfortable, from its ABZORB heel cushioning to its injected molding midsole that provides cushioning from each impact, this is a trainer that offers the arch support overpronators need while also being an overall comfortable running shoe. Plush without losing responsiveness and flexible while also offering a great amount of control, this is a solid trainer, stability or otherwise. Its eye-catching design and affordable price are also attractive elements to consider, but just because it’s reasonable doesn’t mean New Balance skimped on any of its features. Its thick outsole features tenacious traction in its diamond-shaped lugs, while the overall performance of the 680 v3 could make it a favorite everyday trainer for those that overpronate or even neutral runners. 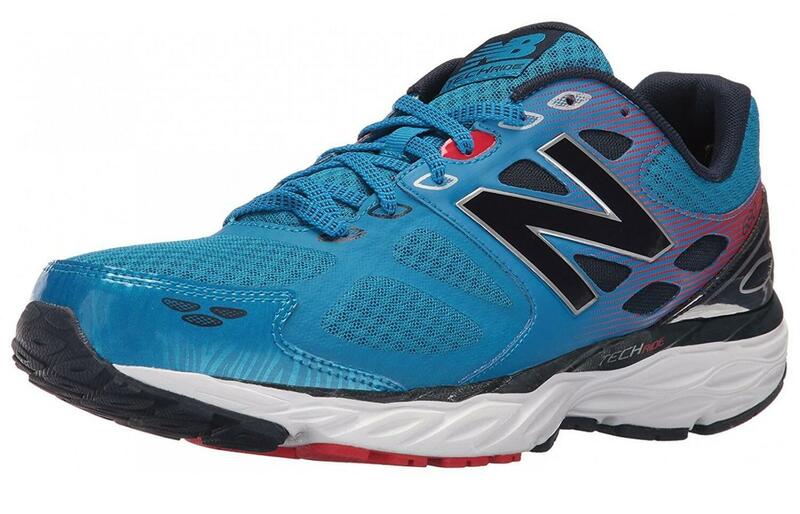 Filled with features that would suggest a higher-priced shoe, and a stability shoe that delivers in performance, protection, and design, the New Balance 680 v3 stands out among other comparable shoes on the market today- and one that doesn’t break the bank while doing so.